Good day my sweets. Things are a buzzing and busy at the nest. Nothing show worthy yet. So instead I thought let’s do that special home tour that I promised you. 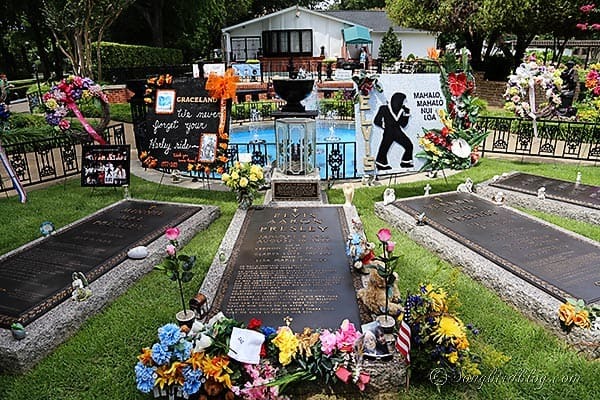 I am sure it is no surprise that while we were in Memphis during our Summer holiday tour we visited the home of Elvis Presley. Yep, that’s me grinning at the welcome sign. 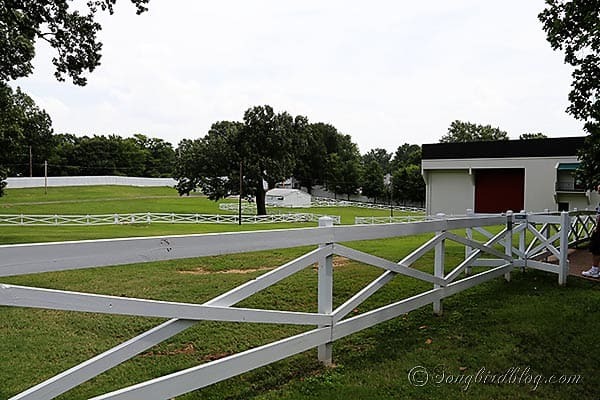 When visiting Graceland you are received across the road where you take a small tour bus to cross the street and drive up through the famous gates. Kind of hard to photograph them from the bus, and I forgot to go back for them. Graceland is kind of epic in its stories. So I was quiet surprised to see that it wasn’t as big of a house and estate as I had expected. I am sure it was quiet magnificent to the standards of the time though, and to think that Elvis was able to buy it when he was still very young (about 18 if I remember correctly), is impressive. Upon entering you almost immediately end up ‘in’ the living room. I was very surprised how much I liked it. Sure it was opulent and a bit over the top. But I thought it was very tasteful and quiet modern too. I loved the stained glass windows with the peacocks. 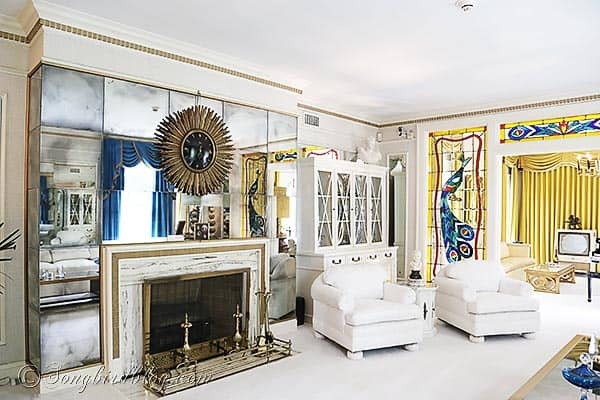 Peacocks are making a return in decorating, so Elvis was spot on with those. And that lamp there in the corner, I think you can still buy those now. Apparently this white couch is famous. I am not into the Elvis stories well enough to know why. But it looked comfy enough. Opposite the couch was the fire place. Again surprisingly up to date with a sun mirror. I thought the mirrors around the fire place could still work today. And that hutch in the corner: give it to me! Across from the living room was the dining room. There was a staircase in between those rooms, but we were not allowed to see the upstairs. They keep that part private. Makes sense. Next to the dining room was of course the kitchen. Fairly large and probably modern for its time. But it definitely wasn’t a favorite room of mine. From the kitchen you walked to an extension of the house that Elvis had built himself. Apparently it was his favorite room. In spite of all the windows, it was a dark room, with two main colors, green and wood. It had lots of quirky elements and a lot of it was custom made. Not my style but I can appreciate the craftsmanship that went into this chair. From this room you could go outside and admire the grounds and some buildings out back. There was of course a pool, and a pool house. There used to be a racket ball court but that was now converted into a gallery. And in the former Zen garden, was the small cemetery, where Elvis and his family have their final resting place. As you can see it is still visited a lot. But let’s go back inside. We weren’t done yet. 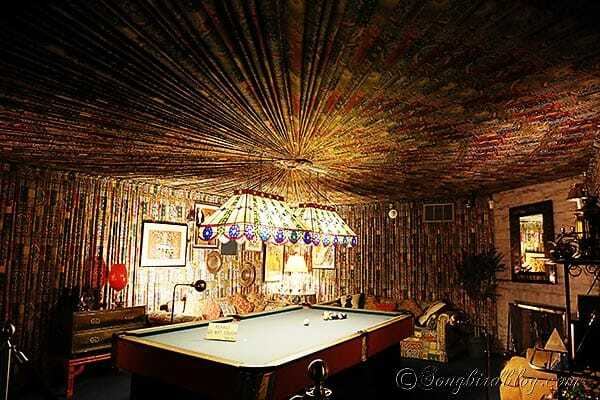 Because Elvis had built himself a true man cave. Downstairs there was the music room. State of the art equipment, decorated with a gazillion mirrors and in black and yellow. It had a seventies vibe for sure, but there were a lot of modern elements here too. Look at the decorations on the shelves behind the bar (you did expect a bar in the man cave, now didn’t you). Sea coral, glassware, silver pieces and decorative boxes. No modern day blogger would be ashamed to show of these shelves in her home. Across from the music room was the game room. Speak about over the top. All walls and the ceiling were covered in pleated printed fabric. The furniture had colorful fabric too, and the Tiffany lamps had a lot of color going on too. It all still looked very bright and not faded, probably because there was no chance of any sunlight coming in. I’d go stir crazy in that room if I’d have to spend more than 30 minutes there, there was no where to rest your eyes. But I am sure it had stories to tell about good times that where had by all in there. I was happy to be outside again though. That man cave had me feeling a bit claustrophobic. Outside there was a lot of room. Room to ride horses, or motorcycles, or buggies and golf carts or anything else Elvis and his friends could think of. And he sure did like to ride around. An over the top glamorous black beauty. And a fun little pink golf cart. Of course sometimes driving wasn’t fast enough…. The full sized air plane Elvis used to fly around the country. He also had a small jet, for shorter trips. We all should have a small jet, for visiting friends, don’t you think? You could come over for tea in your small yet, and I would receive you in my parlor. I didn’t have a lot of expectations for visiting Graceland. It was simply one of those things you do when you are in Memphis. But I was pleasantly surprised. It was fun. This house loving gal, loved his home, the exhibitions were interesting and his life a whole lot more crazy than I knew. I am glad we didn’t miss it. I will be humming All Shook Up all day now thanks to this post. Hi Marianne! That was interesting! Seeing your pictures, I also thought the living room quite up-to-date with the style today, that did surprise me. 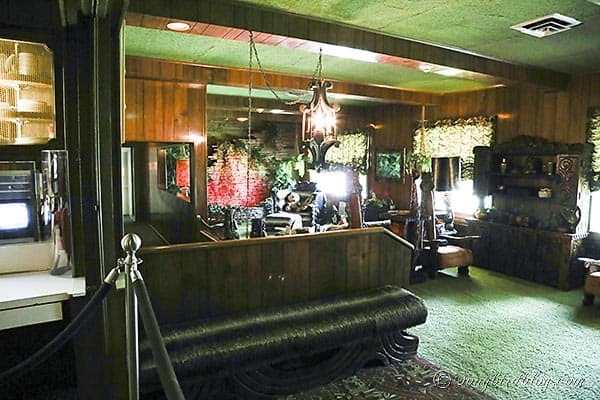 Funny seeing the rest of the rooms, the late 60s and 70s style, lol…weren’t we crazy with color then?! I was a kid at that time and my favorite colors where green and orange combined…crazy I tell you! My husband’s a big fan of Elvis and if we ever get the chance to visit the southern USA road trip style, I would really love to tour this with him.